Fall is in the air, a great time to get started on your Christmas shopping. My first concern is loyalty to my customers, I ship the day I get paid, unless it's on the Sunday, then first thing Monday mornings. Customer satisfaction is my number one goal. 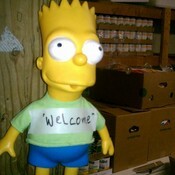 I'm an avid Simpsons fan and collector. I also like to buy and sell antiques. If you want Simpsons merchandise, get ahold of me through a message, as I may very well have it, so if I do, then I will list it for you. also deal in new and lightly worn clothing and other collectibles.Positive feedback is always welcome, and if there are any problems with orders, I will work it out with you the buyer. I insure my shipments. Also if you want to make an offer on anything, contact me. Please feel free to read my feedback. Please follow me on Twitter. Tweet Dongzilla55. You can also find me on Facebook, Search for Doug Dingman. My tweets get posted on my Facebook page as well. dongzilla55 doesn't have any items in their booth! Love the variety.. with five children, definite potential gift ideas, for upcoming birthdays, etc. I will be sure to visit your booth again.